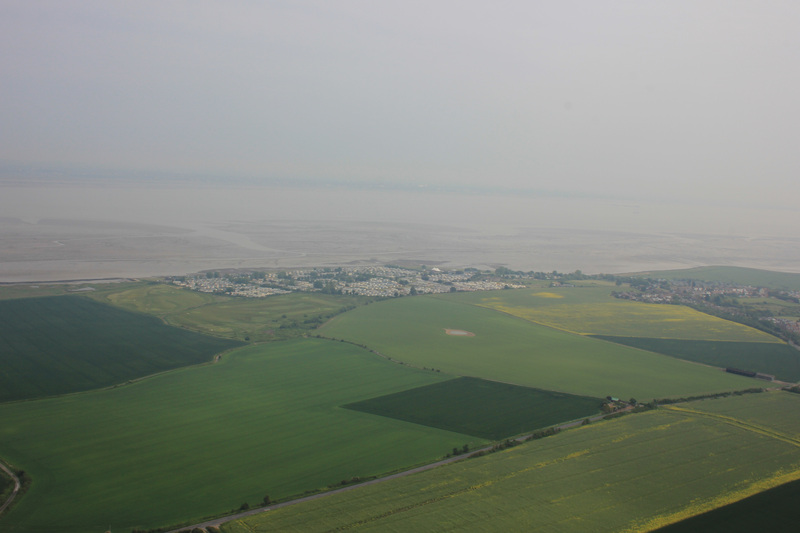 North we flew, back over the Medway, away from Rochester and towards Cliffe. 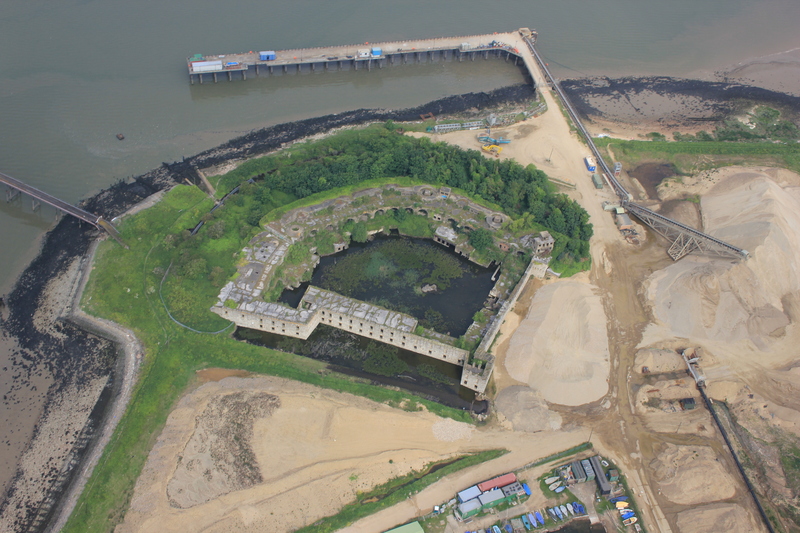 When we had passed Cliffe Fort two years ago it was sealed off and appeared flooded inside. We could have crawled through a window, but decided not to. 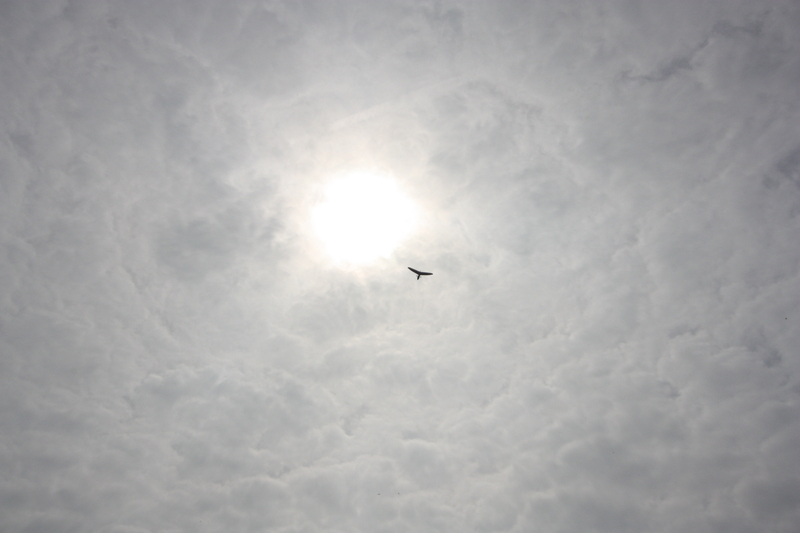 Today, we flew directly overhead. It was still flooded. Can you see that “V” shaped cutting in the shoreline between the two jetties? That is the Brennan Torpedo Launch. The Brennan Torpedo was patented in 1877 and is said by some to be the first ever guided missile (although in fact it wasn’t; there were earlier examples – it’s just they didn’t work as well as the Brennan). 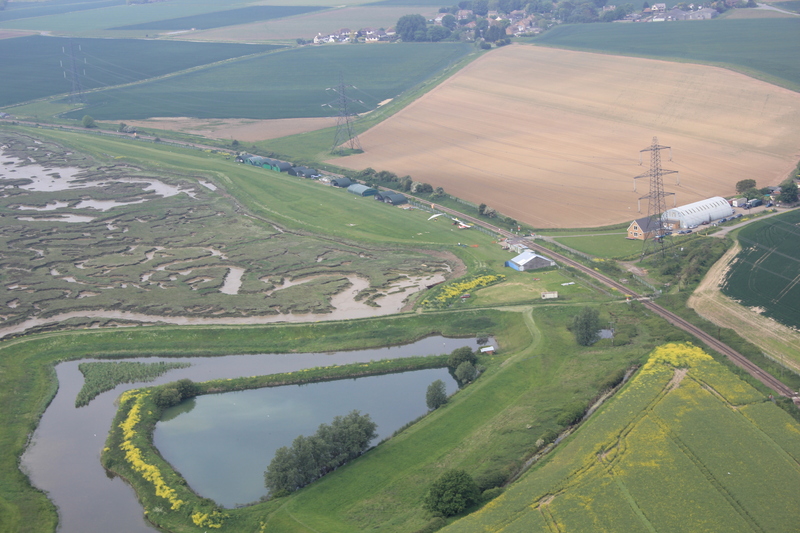 We turned east, flying over the remains of the Curtis & Harvey site. They made explosives here between 1901 and 1921, including the highly dangerous nitroglycerine. The buildings were spaced apart from each other so that if one went up the others were better protected. The walls of the buildings were made of brick and then shored up with earth embankments, and it is these banks which are so visible today. The roofs were made of wood. This meant if there was an explosion in one of the buildings the blast would be forced upwards, through the roof, and not sideways through the walls. 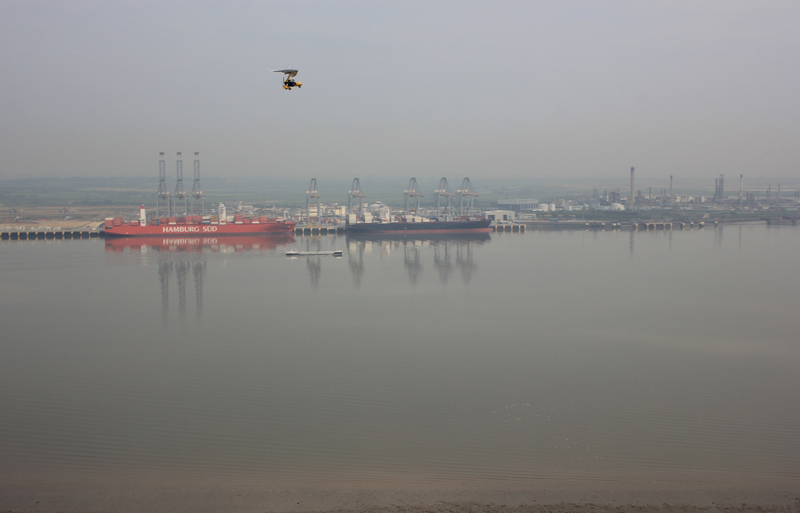 Whilst we flew directly over the southern bank of the River Thames, Alex’s microlight headed out over the river, towards the tankers and chimneys of the Coryton oil refinery. 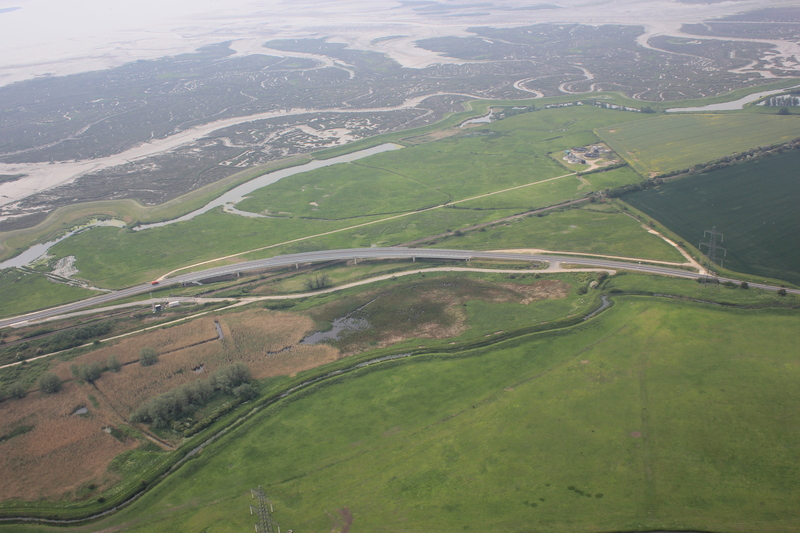 The stretch of riverbank we were flying over was deserted. I remembered it well from our walk here two years ago. On leaving Gravesend there is nothing for about 14 miles until you reach Allhallows. As a result very few people come here. 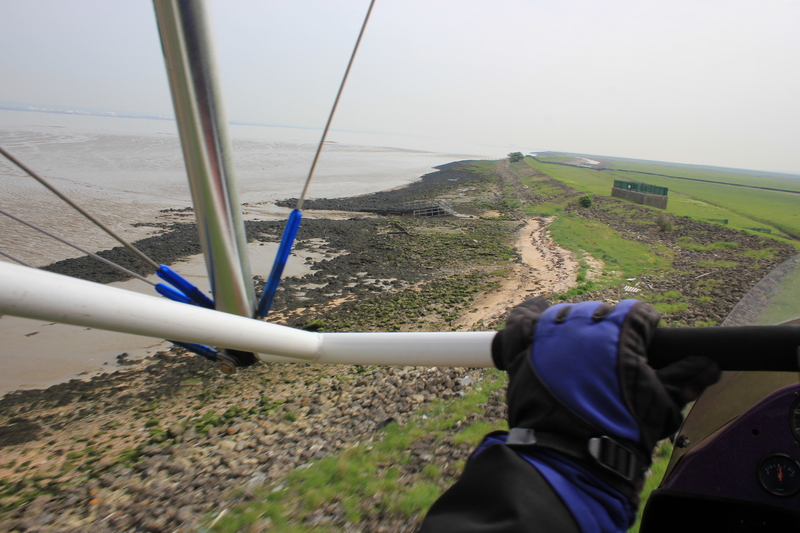 My pilot took full advantage of this, dipping the microlight’s nose down and dropping until we were only about 20 feet off the ground. For half a mile or so we skimmed the ground and ruffled the grass before pulling up again as we reached Egypt Bay. 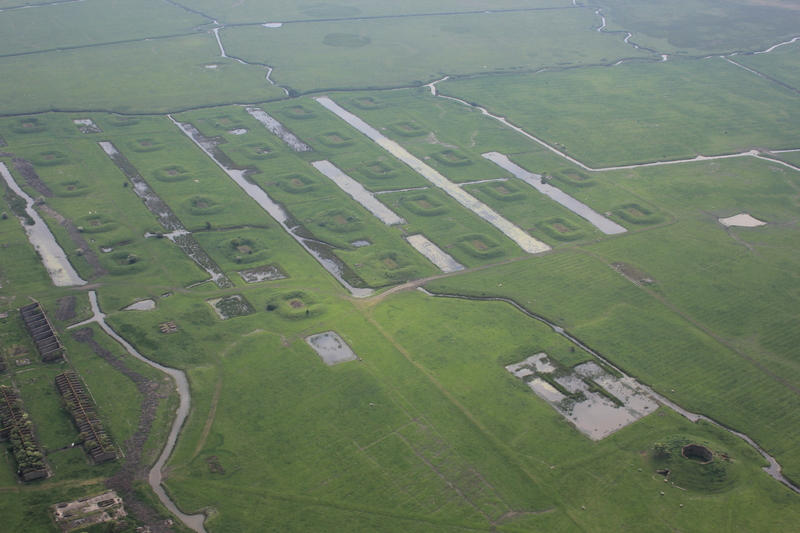 As we gained altitude again I saw places I remembered well. Look! 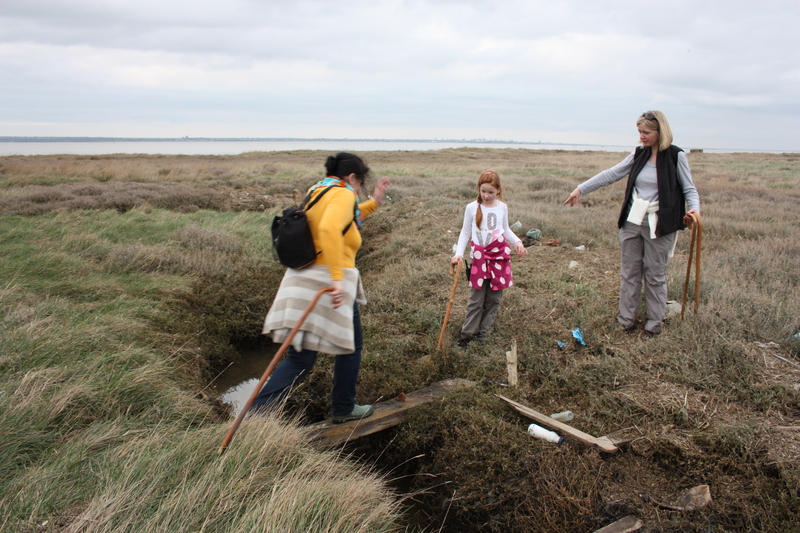 There was Allhallows caravan park and, to its left, the marshes we got a bit lost in. And look! There was the recently completed Stoke Bridge, where that unpleasant workman tried to force us into the back of his truck rather than let us walk along the side of the road. This bridge was under construction the last time we saw it. It was completed now. When we walked along that stretch of road two years ago, signs said it was a road accident hotspot and that there had been many deaths. Had the bridge changed that, I wondered? Down on the ground, Big Ben had my spare camera and took a great shot of us flying against the sun. We circled around and started our approach to the landing strip. The kids waved as I came in to land, and I waved back. 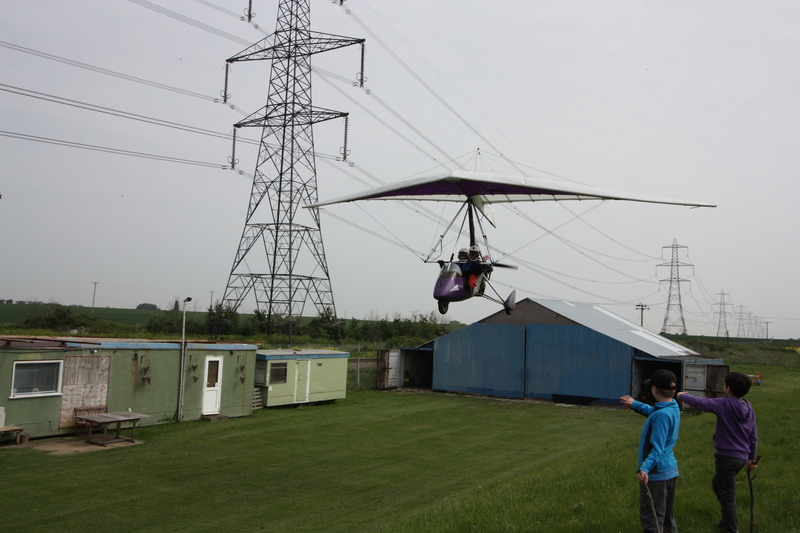 This entry was posted in Kent and tagged Cliffe, coast, flying, fort, Kent, microlight, nitroglycerine. Bookmark the permalink. That looks a wonderful trip. I do like flying but not sure I have the nerves for that! Was it an expensive trip? No – it was really good value – £65 for a half hour flight. Very highly recommended. Thanks, not a bad price at all!